| Where Does Inspiration Begin? 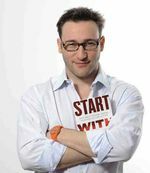 | Simon Sinek author of Start With Why? Home > News and Events > Events > Where Does Inspiration Begin? | Simon Sinek author of Start With Why? Where Does Inspiration Begin? | Simon Sinek author of Start With Why? Welcome to The Canadian Career Development Series. The place in Canada to learn how to effectively manage your career at the convenience of your own desk. Learn from leading authors, thinkers, and professionals as they share their advice on how to take your career to the next level. There are leaders and there are those who lead. Leaders hold a position of power or influence. Those who lead inspire us. Whether individuals or organizations, we follow those who lead not because we have to, but because we want to. We follow those who lead not for them, but for ourselves. Simon Sinek teaches leaders and companies how to inspire people. It’s informal, fun, and could it be more convenient? Expand your networking contacts across Canada- Join our CareerJoy invitation only group. Ask us how to use this towards your professional development credits.